This week I am not just randomly pulling cards. I am consciously choosing them because of my experiences over the past two weeks. An aunt of mine went to Belgium where she researched a member of our family who died in World War 1. I didn’t even know she knew anything about him. His name is on the family tree with no information only that he died in the war. She found his grave, laid flowers there and brought home the information on him from the war records. I have since found it on the internet of course, now that I have his whereabouts and date of death. “Coincidentally” enough he died on Feb 19th 1917 and my oldest son was born on Feb 19th 1985. There’s a reason for everything – what it is yet, I do not know. Abraham Hicks tells us that our ancestors by asking for what they wanted, propelled it forward into future generations, so that we would be able to receive it, (if that makes sense.) Check out youtube videos, you will come across what will be of interest to you. I also do believe that “he showed himself” at this particular time, through my aunt deciding to look for his grave, to help me break through the fear barrier. I of course realised then my stuff is minuscule, compared to what he went through and what others are still experiencing in some parts of our world today, but fear is fear as they say, but we must let it go and we will. We have lots of help in doing it. So the card I have pulled to go with this message is from Wood You Believe deck by Jim Cogley (its an ancestral healing deck.) FEAR – The human person is a bundle of unlimited potential. Fear can so petrify potential that it never comes to anything. Courage is the way to reclaiming our lives. It is doing the thing we don’t like in order to achieve what we most want. Courage is not acting without fear, rather it is acting in spite of our fear. *Where does fear most rule in my life? * Am I an approval addict always fearing what others may think? *Am I a closed book afraid of what others may see if I opened up? *Am I willing to daily take risks and extend my comfort zones? * Am I courageous enough to face up to my deepest fears? FEAR – Face Everything And Recover. I have also chosen the FAMILY TREE card from the same deck. Stretching back into time immemorial we have literally thousands of forebearers. These are people who often survived against all the odds, times of hunger and poverty, war and disease, injustice, oppression and hardship. It is an amazing fact that if any one of those ancestors had not survived, had died as an infant, been killed in a war or even had another partner, then you or I would never have even been heard of. We just would not be here. Such is the delicate fabric of life and what far reaching consequences there are when we fail to respect it. *What ways can I honour my ancestors? * What positive traits have I inherited from my ancestors? * What negative traits may also have been passed on? * What ancestral gifts have been handed down in my family? * What am I adding to my family tree? We are products of those who have gone before us. 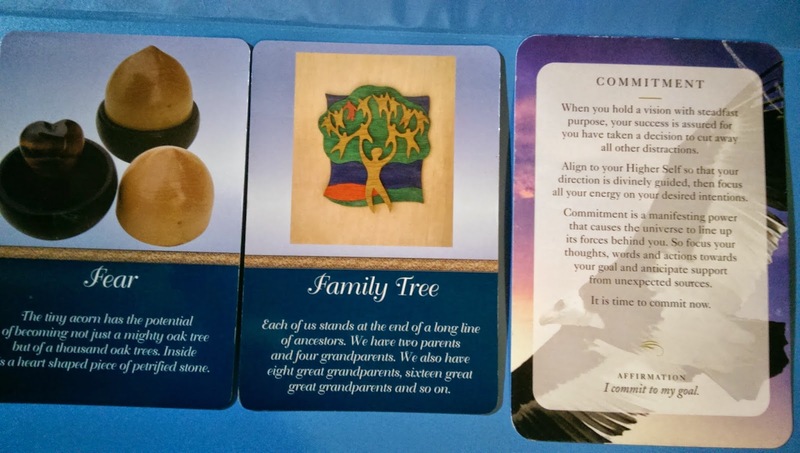 All of this leads to my last card which is from Diana Cooper’s Wisdom deck. When you hold a vision with steadfast purpose, your success is assured for you have taken a decision to cut away all other distractions. Align to your Higher Self so that your direction is divinely guided, then focus all your energy on your desired intentions. Commitment is a manifesting power that causes the universe to line up its forces behind you. So focus your thoughts, words, and actions towards your goal and anticipate support from unexpected sources. It is time to commit (to your life purpose) now. Breathe, relax and let go of buying into the fear. Each time it is triggered, it is easier to see it is not about real stuff. It is usually about something you think might happen, that rarely does. But if it does, that is when you deal with it, not long before it has even happened!! Now that I am out the other side, it is funny looking back at it of course.